Having been obliged to commit his last available strategic reserves to bring the British offensive to a halt, on 29 June Rommel requested permission from Hitler to allow the Seventh Army to begin a fighting withdrawal towards the River Seine; a move which would be mirrored by German forces in southern France to form a new front line along the Seine towards the Swiss border. This was partially endorsed by Hausser, who on 30 June proposed pulling back from Caen. However, encouraged by the outcome of the fighting in the Odon valley, Hitler stated that "we must not allow mobile warfare to develop", committing his troops in Normandy to "a policy of aggressive and unyielding defence". On 2 July, Scottish patrols produced the first evidence of this, reporting that south of the Odon the Germans were digging in. Aerial photographs taken two days later provided confirmation, showing large numbers of newly dug weapon positions, and by 8 July the German forces facing VIII Corps had fully entrenched themselves. 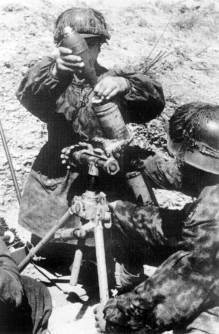 Some local adjustments occurred as both sides sought to improve their tactical positions, with the 12th SS Panzer Division launching a successful attack to capture Fontaine-Étoupefour on 2 July. The serious losses sustained in maintaining an increasingly costly static defence led to fractures in the German high command. On the evening of 1 July, in a conversation with Wilhelm Keitel, von Rundstedt advised; "Make peace, you fools." Shortly afterwards, Günther von Kluge replaced him as Commander in Chief West, and due to disagreements with Hitler over how the campaign should be conducted, Heinrich Eberbach replaced von Schweppenburg as commander of Panzer Group West. During the lull in fighting both sides made several changes to the disposition of their forces. The 53rd (Welsh) Infantry Division relieved the 15th (Scottish) Infantry Division in the west of the British salient, while the 43rd (Wessex) Infantry Division relieved the infantry of the 11th Armoured Division, who where still holding the Odon bridgehead. The Germans moved up the 277th Infantry Division, which began to relieve the 9th SS Panzer Division and the battle group of the 2nd SS Panzer Division. 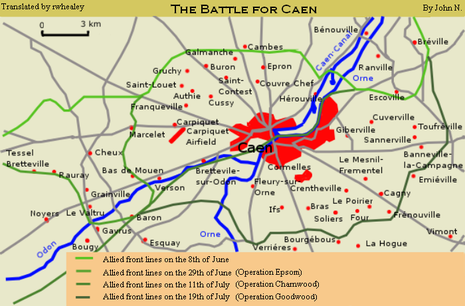 A few days later the British Second Army launched a new offensive, codenamed Operation Charnwood, to gain possession of Caen. This incorporated the postponed attack on Carpiquet, originally planned for Epsom as Operation Ottawa but now codenamed Operation Windsor. In a frontal assault the northern half of the city was captured, with the remaining portions being taken during Operations Atlantic and Goodwood in the third week of July. The fighting in the Odon Valley would continue; on 10 July Operation Jupiter was launched by VIII Corps to push back the German forces near the village of Baron-sur-Odon, retake Hill 112, and advance to the River Orne. 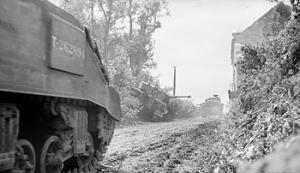 Additionally the Second battle of the Odon was launched on 15 July to divert German attention away from the battleground Operation Goodwood would be fought on; the second battle has been called one of the bloodiest encounters of the campaign.